The Debian packages (ending in .deb ) that Software Center offers are actually archive files containing libraries, configuration files, and executable programs. If you install the Firefox package, for example, the package manager distributes the necessary files to the correct places in the filesystem. To access the Software Center, press the Super key  and enter softw . The start page (Figure 1) features a few What's New and Top Rated applications. Clicking More on the far right gives you additional choices. Use the arrow icons in the upper left to return to the start window. 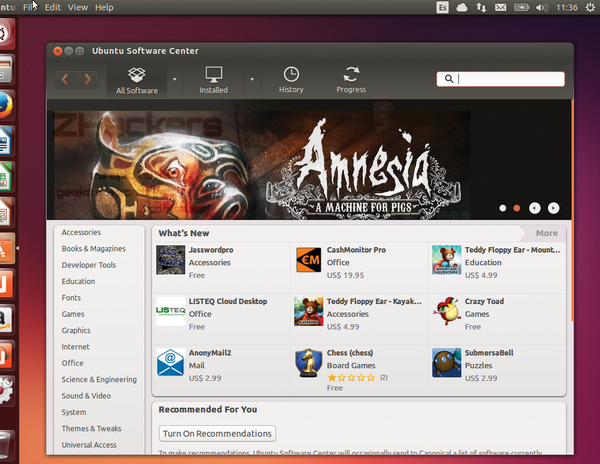 Starting with the release of Ubuntu 12.10, Ubuntu developers have placed ads for free and commercial software from the Software Center across the broad surface of the screen under the heading Our Favorites . The left side of the Software Center screen organizes the applications by category. Clicking a category opens subcategories (Figure 2). All other controls are at the top of the package management window. 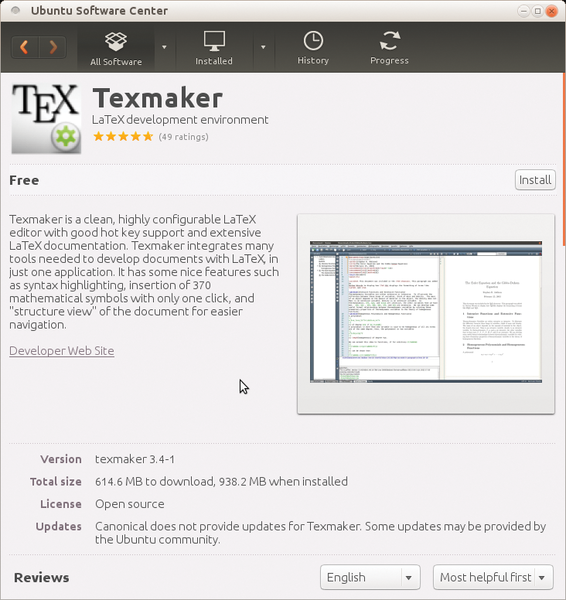 The All Software menu lists all the software in all the available repositories. 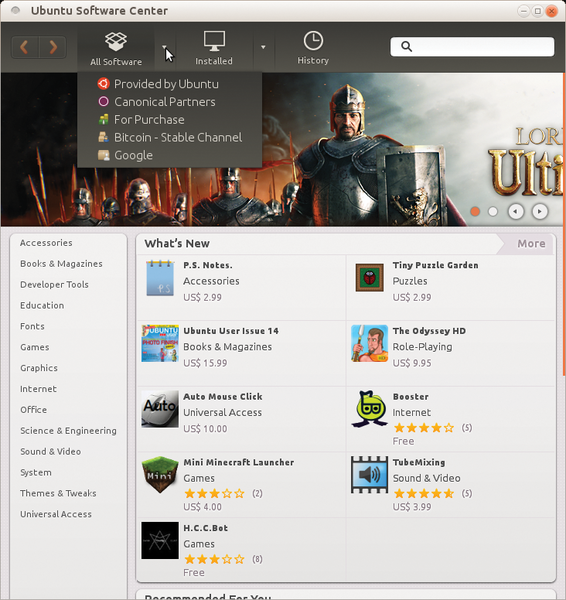 If you click the small white triangle next to the menu item (Figure 3), you will find the entries Provided by Ubuntu (mostly free software), Canonical Partners (free and commercial software without source code, e.g., Skype and Flash), and For Purchase (commercial software, including many games). Clicking Installed on the menu bar at the top displays only the installed applications, sorted by category. Click the little triangle to the right to view the packages from a single source. At the far right is the History menu item that tells you which software you downloaded. Check here if an upgrade suddenly isn't working. Downgrading, unfortunately, doesn't work in Software Center. To do that, you must install the Synaptic Package Manager and specify an earlier Version in Properties . If you already know the name of the software, you can search for it in the search field at the upper right. Results come from the repository that you use for All Applications . Next to the software names are the ratings in the form of stars. Once you select a package, the More Info and Install buttons appear. The Software Center global menu includes other interesting options. In the File menu, you can choose Reinstall Previous Purchases or Sync Between Computers to move your package selections to other computers over the Ubuntu One cloud service. Also, you can use Edit | Software Sources to add other repositories. If you don't want to display new applications automatically in the Launcher, unmark the New Applications in Launcher check box in the View menu. The Opera repository  is one of the external repositories, and it provides the Opera web browser that is missing from Ubuntu's standard repositories. The VirtualBox project  provides the proprietary version of its own software, which supports the virtual USB 2.0 ports and Remote Desktop Protocol (RDP), from its own repository.